Seth C. Cary, John Cary, the Plymouth pilgrim, , at https://books.google.com/books?id=oDgcAAAAYAAJ . Boston, Massachusetts: (1911) , p. 67, section 7-A. Vital records of Bridgewater, Massachusetts, to the year 1850, Boston, Massachusetts: New England Historic Genealogical Society, (1916) , Vol. 2, p. 429. Charles Hutchinson Thompson, A Genealogy of the Descendants of John Thomson of Plymouth, Mass: Also Sketches of Families of Allen, Cooke and Hutchinson, , at https://books.google.com/books?id=NTxWAAAAMAAJ . Lansing: Darius D. Thorp, (1890) , p. 237. Vital records of Bridgewater, Massachusetts, to the year 1850, Boston, Massachusetts: New England Historic Genealogical Society, (1916) , Vol. 2, p. 28. 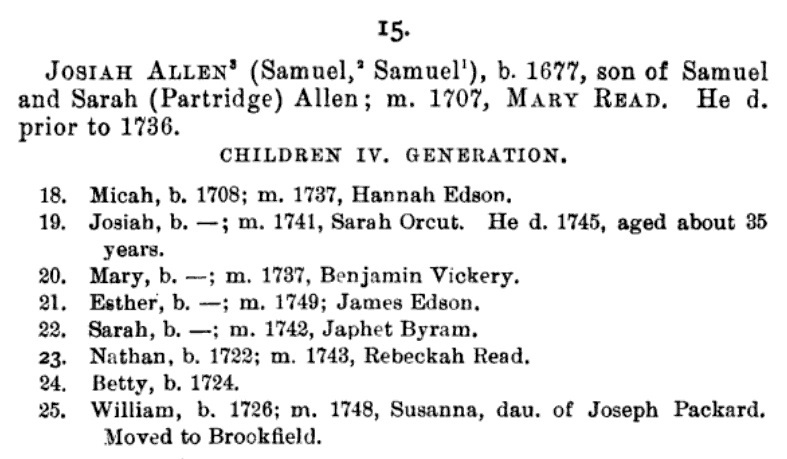 "Massachusetts Births and Christenings, 1639-1915," database, FamilySearch (https://familysearch.org/ark:/61903/1:1:V5NC-C8B : 4 December 2014), Josiah Allen, 03 Feb 1742; citing BRIDGEWATER,PLYMOUTH,MASSACHUSETTS, ; FHL microfilm 164,691, 164,692. 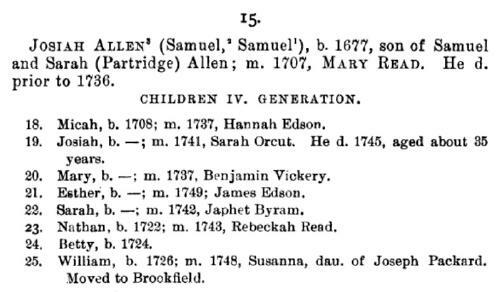 Lydia Allen was born perhaps about 1712. Vital records of Bridgewater, Massachusetts, to the year 1850, Boston, Massachusetts: New England Historic Genealogical Society, (1916) , Vol 1, p. 29. Vital records of Bridgewater, Massachusetts, to the year 1850, Boston, Massachusetts: New England Historic Genealogical Society, (1916) , Vol. 1, p. 29.
living at Eden, Marshall County, Iowa. 1900 United States. Census Office. 12th census, 1900 population census schedules, Washington, District of Columbia: Bureau of the Census Micro-Film Laboratory, ([197-]) , IOWA > POLK > SAYLOR Series: T623 Roll: 455 Page: 239. 1900 United States. Census Office. 12th census, 1900 population census schedules, Washington, District of Columbia: Bureau of the Census Micro-Film Laboratory, ([197-]) , Census Place: Saylor, Polk, Iowa; Roll: 455; Page: 5A; Enumeration District: 0109; FHL microfilm: 1240455. 1910 United States. Bureau of the Census. 13th census, 1910 population census schedules, Washington, District of Columbia: Bureau of Census Micro-Film Lab, ([19--?]) , Census Place: Saylor, Polk, Iowa; Roll: T624_418; Page: 12B; Enumeration District: 0179; Image: 978; FHL microfilm: 1374431. 1920 United States. Bureau of the Census. 14th census, 1920 population census schedules, Washington, District of Columbia: The National Archives, ([193-?]) , Census Place: Marshall Ward 2, Marshall, Iowa; Roll: T625_502; Page: 14A; Enumeration District: 163; Image: 537.